In the years leading up to my successful bid for early tenure as an assistant professor, I designed and taught two new graduate courses (of the five courses I was required to teach each year), led two major million dollar research initiatives, won a teaching award, published seven journal articles and three book chapters, presented at several national and international conferences, supervised two masters students who completed their theses, and gave birth to my first child. Far from this being the start to a hero story, the intense pace and heavy workload I experienced as an untenured, female academic also included an unplanned one-week hiatus in hospital to be treated for a peptic ulcer and lectures on finding balance from my physician. While I survived my own sprint to tenure, I almost sacrificed my health and wellness. Sadly, my experience is all too common. Many untenured professors are struggling under unwieldy workloads and relentless demands from colleagues, students and the institution. In order to thrive and maintain balance during the long marathon of a successful academic career, I have learned to be very intentional about how I balance a demanding academic career while still enjoying an active and healthy family life. Based on my experience as an academic and mother, I offer the following advice for surviving and thriving on the tenure track. First, time away from campus can be great for reflection and personal growth, especially on gender dynamics, as well as for being productive. Leading up to promotion as an associate professor, I gave birth to my second child. What was different this time, in addition to having both a toddler and a baby at home, was that I took a maternity leave combined with a sabbatical, and worked from home. In between potty training, playdoh and naps, I reflected on and wrote down my long-term goals as an academic, wrote and published a book, edited a peer reviewed journal and supervised my graduate students. I also made time for selfcare and good habits, like walks and play time with my children, preparing and eating healthy meals with my spouse, making time for daily exercise and getting enough sleep (okay, this last one continues to be a work in progress). Lately, I find that bringing academic work with me to the arena is a strategy that helps me to balance watching my two teenage hockey players with marking papers, drafting reports and reviewing dissertation chapters. So, balance work on campus with work at home to strive for optimal productivity. Second, learn when to say yes and when to say no. Along my own tenure track pathway in academia, while balancing research, teaching and a demanding family life, I have learned that saying YES to diverse and unexpected invitations and opportunities to become involved in councils and committees, engage in projects, new teaching and research initiatives, innovative course design work, collaborative design and research teams, using a new technology or design for teaching, working with educators in the ministry and leaders in the classroom, has expanded and enriched my career in rewarding and exciting ways. I have not followed a linear path. A diverse range of projects, courses and leadership and service roles have challenged me to learn, grow and change in ways I could not have planned for and certainly didn’t imagine when I started my initial teacher preparation program almost 30 years ago. I am still excited and passionate about being a professor every day because of the dynamic nature of the work. In the years between associate and full professor, I have also learned when and how to say NO. In part, saying no means that you hold yourself to your big goals, set priorities and establish boundaries. Set reasonable timelines for projects and block time in your calendar for this work. Blocking time for your priorities and projects gives you an idea of any “left over” time you might have for new requests. Avoid putting your own work, your own scholarship, and your own teaching, last. Avoid procrastination and time sinks, like twittering away hours on social media. Go for a walking meeting instead of taking a coffee break. There is more than enough work to go around, so you do not need to do it all. Learn the graceful art of saying no: Thank you for this invitation to become involved in…. I appreciate being asked… I regret saying no, however, I am fully engaged in… I am working towards a deadline for… Two of my doctoral students are working towards candidacy… Please approach me again in the future. So, strategy two is to learn when to say yes and when to say no. Third, manage your time or others will manage it for you. I have learned to make every moment in my day count through the use of routines, processes and tracking systems. For example, I attempt to clear my inbox each day by acting/responding, filing or deleting. I eat a healthy lunch while reading graduate student papers and chapters. I develop systems and strategies, like daily, weekly and monthly lists, project management plans, and accountability charts, to keep on top of my work and reward myself for getting things done. I regularly document and track my accomplishments, through curating my curriculum vitae, organizing and filing relevant documents (such as teaching evaluations, evidence of productivity), sorting and organizing printed materials in my yearly Performance Review folder. Fourth, find ways to become fully engaged with your academic community, on your campus and with colleagues at other universities, and seek out positive colleagues who generate energy rather than take energy. Work with trusted mentors and credible information to prepare for the tenure and promotion process. Too many new professors, myself included, experience fear and anxiety about the tenure and promotion process because they get seduced by urban legends and hallway talk, or get discouraged by sour colleagues, instead of talking to positive colleagues in senior leadership who have experience with the process. Instead, I encourage junior colleagues to seek out high performing and generous colleagues as mentors and coaches who will advise you, review your CV, recommend strategies to strengthen your research, teaching and service portfolios, and outline the tenure and promotion process at your institution. Talk to trusted mentors instead of getting distracted by horror stories, hallway talk and disenchanted colleagues. Finally, develop a knowledge mobilization plan and project timeline for your research activities, grant writing, journal articles, conference papers and presentations, and other outcomes of your scholarship. Great advice I have been given and now live by is to set timelines and goals for the “productivity pipeline,” which means I aim to have a few manuscripts in preparation, a few manuscripts submitted for consideration, and a few works in press. I do keep track of new ideas that can be shaped into proposals for grants, conferences or journals. Prior to conference presentations, I try to work with my colleagues to develop a plan and deadline to prepare and submit the paper to a journal. Do not fly solo! Enhance your growth and productivity as a researcher by working with a collaborative research team that shares expertise and is willing to work on several manuscripts, with different leads on each on, at a time. Finally, and importantly, an investment that always pays off huge dividends is to mentor and support your graduate students as first authors by coaching them on academic writing, and also by co-writing articles and co-presenting at conferences with them. A question I often hear from students beginning their graduate studies is, “What is CSSE?” To be honest, and likely stemming from my own inexperience in academia, I have rarely answered this question to the extent it deserves. The obvious answer has been, “CSSE is an annual meeting of people similarly interested and invested in your area of study. It is an opportunity to refine your ideas and to hone how you present those ideas to your peers.” Undoubtedly, this professional development aspect of CSSE is important; developing expertise in a scholarly discipline requires more than just reading and writing about your topics. The finely polished ideas that end up on paper can take abstract and tangled forms when conjured from the back of your brain to the tip of your tongue. Nevertheless, as a short answer to a tall question, it at least alludes to why young scholars should consider submitting their work, if not attend simply to engage with their ideas at a deeper level. However, interacting with like-minded scholars constitutes only one aspect of how I have come to see CSSE, and similarly structured conferences for that matter. The what I have come to appreciate is exactly what I use to ignore. Rather than attending only those sessions that meet a keyword search of the program-yes, a practice of which I am guilty-I have realized the value of attending sessions that analyze familiar ideas through frames you had never considered, that challenge taken-for-granted ways of thinking or staunchly held perspectives, and that introduce entirely new ways of perceiving the world and make you feel like a stranger in a familiar space. These sessions have not merely expanded how I think about scholarship; they have changed how I see the world. Through others’ understandings, stories, and lived experiences, I have been guided through cognitive terrain that would be otherwise intractable-becoming a cognitive nomad of sorts. During this year’s CSSE, for instance, those in attendance at Dr. Marie Battiste’s plenary will remember being guided on a cultured footpath that examined and elucidated how “we have all been marinated in Eurocentrism.” It’s an understatement to say my lived experiences were insufficient to have independently reached the places that followed her assertion; as set out in the implicative part of the plenary’s title, my thinking about decolonizing and indigenizing academia has since changed. In an unexpected way, finding and being guided down unfamiliar cognitive paths has also helped me to better navigate the conceptual and theoretical terrain of my field, knowledge mobilization. Take, for example, Dr. Carol Weiss’s landmark article, The Many Meanings of Research Utilization. 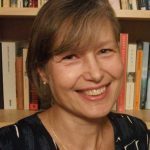 Although it was published nearly four decades ago, her article continues to receive frequent citation by those concerned with how social science is used within public policy arenas. Since I first encountered the article, I’ve come to more fully appreciate its expansive influence and Dr. Weiss’s position on how social science typically enters policy arenas: through enlightenment. Essentially, research will rarely have direct, measurable effects on policy-tracing the impacts of single studies or even research programs is a “wicked” problem. Instead, it is the propagation of concepts and theoretical perspectives throughout social structures that lead to research use. Analogously, it has been the permeation of ideas and ways of thinking from other fields that has enabled me to re-evaluate my worldview and appreciate the value in abandoning narrowly-focused keyword searches. All of this is not to counterpose the excitement and gratification that come along with immersing yourself in a field, seeing how that position enables you to make positive change, and meeting your academic heroes (for me, the adage “you should never meet your heroes” has not held water in academia). You should be giddy when meeting the people whose work has inspired and enlivened your academic passions, just as you should be devoted to attaining a similarly influential position. Attend the sessions, plenaries, get-togethers, and general events aligned with your area of research, but also to step back from the metaphorical microscope and look around. Thanks for the memories, Regina! Let me begin this blog post with a huge shout out to the University of Regina for the wonderful CSSE experience! The 2018 annual conference was my fourth as a graduate student. Once again, I returned home excited by all the learning, as well as by the many opportunities to connect and reconnect with Canadian colleagues. As Dr. Kathy Sanford (winner of the 2018 Herbert T. Coutts award) shared at the CSSE award ceremony, one of the key strengths of CSSE is that it brings Canadian researchers together in conversation and focuses on educational issues important to our context. Importantly, Dr. Sanford not only encouraged academics to champion and attend CSSE events and initiatives, but she also challenged them to bring their graduate students and help them to become a part of the CSSE community. For graduate students, what makes CSSE so thrilling is that we not only have the opportunity to see, hear, and even meet some of our academic heroes, but we can also better understand how to build on their academic legacy through our own research projects. As such, having the financial support to attend the annual conference cannot be understated. I am so grateful to the University of Regina for the travel award that covered room and board for me this year. I truly appreciate all other supports offered, including CSSE’s partial travel reimbursement. For me, the Regina conference was perfect. The venue size kept all the events localized and I loved being able run into CSSE folk frequently in the halls of the Education building, the social zone, and the food courts. I also appreciated the University’s thoughtful details, such as the live music and the ever-present guides who helped me get to where I needed to be. Another key factor in my heightened experience was that I think my conferencing skills have improved over the years. During my first Congress, I pretty much stuck to presenting my work and attending the sessions of people I knew from my University. What I have begun to better understand is the importance of diversifying my conference approach. This year, I joined and submitted my work across a number of associations. During the conference, I attended as many different sessions as I could, targeting sessions focused on my research and practice interests, but also sessions and keynotes that are completely outside my research domain (I often used the spotlight sessions as a guide). This approach to session selection really stretched my thinking and research direction. What made my experience even stronger was connecting with the presenters in person afterwards or online to continue the discussion. Although it was intimidating to reach out to scholars whose work I love or that greatly influences my research, I found their generosity of spirit and willingness to help me grow to be very encouraging. It also helped to remember that they were students once, too. Another helpful conference strategy is to attend the pre-conference events, which are often more intimate and can be useful to graduate students in terms of networking and building skills. This year, it was great to be a part of the CATE/TATE panel exploring (e)portfolios with Drs. 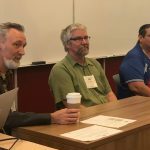 Alec Couros (Regina), Kathy Sanford & Tim Hopper (Victoria), and Norm Vaughan (Mount Royal). I particularly enjoyed the breakout sessions, which were a chance to connect with others around some of the strengths and tensions we are experiencing. 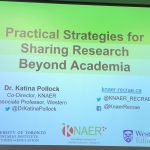 I also found the CASEA session on knowledge mobilization with Dr. Katina Pollock (Western) really helpful and it has already informed some of my research and publication decisions. Finally, it has become clearer to me how valuable getting involved in CSSE and in the associations has been. During the past two conferences, I have made a real effort to attend my association’s AGM and social events. Not only is food often available at the AGMs (I am a student, after all), but these meetings give me a better sense of upcoming events, the role different members play, and how to get involved. At these meetings, I pushed myself to raise my hand for volunteer opportunities such as becoming a graduate student representative or helping organize the CATE student panel highlighting Drs. Leyton Schnellert, Mark Aquash & Tim Sibbald. These opportunities gave me the chance to grow my Canadian academic network and gain valuable mentors and advocates in the field. 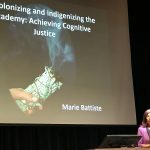 Building on this experience, this year I also made an effort to attend a number of the CSSE special events, including the plenaries [Dr. Marie Battiste’s presentation was off the charts inspiring! ], keynotes, and panels. Highlights included the CATE panel organized by Drs. Leyton Schnellert (UBC Okanagan) & Caroline Riches (McGill) titled Reconciliation and Teacher Education: Sharing and Extending our Practice featuring Drs. Jan Hare (UBC), Dwayne Donald (Alberta), Mike Cappello (Regina), and Celia Haig-Brown (York)]. Receptions, association dinners, banquets, and award ceremonies (congrats Dr. Alesha Moffatt!) also featured heavily in my evening plans. Even if I arrived solo at these events, I would leave inspired, energized and often with a few new contacts and ideas for session selections the next day. Clearly, I had a wonderful CSSE experience in Regina and I am already looking forward to next year. Hope to see you at UBC! 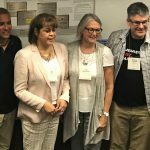 At the end of May, I had the pleasure of attending my very first Canadian Society for the Study of Education (CSSE) annual conference. After some much-needed rest following a midnight arrival in Regina, I began my first official day at Congress – also known as Day Zero of CSSE. One of the highlights of Day Zero was volunteering alongside Local Area Coordinator, Keith Adolph, and his lovely parents. Not only did I receive a warm, prairie welcome to Regina, I also had the opportunity to engage in a discussion of our diverse educational backgrounds and interests that had brought us to CSSE – of course, all of this took place in between our many visits to the University of Regina’s bookstore! The following day, I took part in the Canadian Association for Educational Psychology’s (CAEP) graduate mentoring lunch in honour of the late Dr. John Freeman, a beloved mentor to several graduate students. This was a wonderful occasion to not only meet academics from other universities but to also speak about my research whilst gaining some valuable insight. 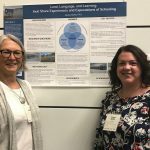 I was paired with CAEP president, Dr. Jacqui Specht, who not only assured me of the importance of looking at inclusion in French Immersion, my area of research, but also suggested some valuable resources. 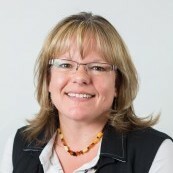 One resource suggested by Dr. Specht was photovoice – an inclusive, qualitative research method in which photographs essentially become artefacts, inspiring dialogue and social change. It was then time to speak, or rather, showcase, my research as a poster presenter for the Canadian Committee of Graduate Students in Education. This was my first research poster presentation so while I was initially a bit nervous, I soon found the right balance of letting my poster speak for itself while also supplying key information and answers for my visitors. I like to believe that I got as much from the experience as I gave, so while I gave several insights into my work, I also received various pathways of possibilities in the form of questions and comments for reflection. On my final day at CSSE, I had the opportunity to attend a Big Thinking lecture given by Françoise Baylis on the responsibilities of scholars in public debates. Given that Françoise’s lecture was part of the first ever all-women Big Thinking lecture series, I was greatly looking forward to it and it certainly didn’t disappoint! 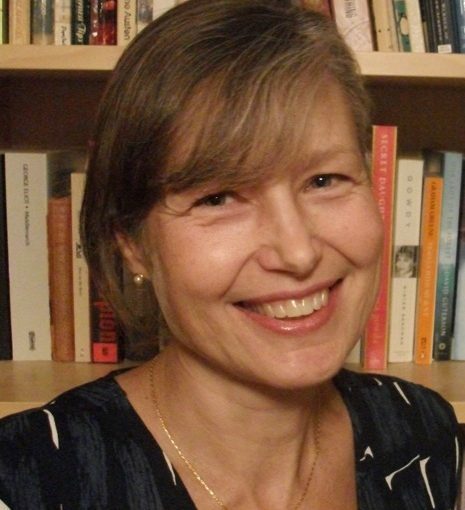 Françoise shared with us her lifelong mantra, “To make the powerful care,” and offered several strategies to do so, such as sharing and expressing knowledge through arts-based or other creative methods and encouraging academics with tenure to speak with, and not for, their colleagues. In the end, the greatest takeaway for me as a young scholar was that the most meaningful work I will ever do is the work of sharing, creating and inspiring new knowledge-words that have already inspired me to attend Congress 2019 in British Columbia themed, most fittingly, “Circles of Conversation.” See you on the left coast, CSSE! My colleagues from three universities, Olivier Dezutter (principal investigator) and Véronique Parent, Université de Sherbrooke, Sunny Man Chu Lau and Corinne Haigh, Bishop’s University, and Cécile Sabatier, Simon Fraser University, and I have been looking into francophone grade six students’ relationships with writing in bi/plurilingual contexts in areas of Quebec outside of large urban centres. We have invited our 11 year old participants to reflect on their scriptural practices and their image of self as writers and as communicators in two or more languages. Through a standardized writing test (WIATT) and student interviews before, during and after an intensive ESL program, preliminary findings have uncovered different dimensions of relationships to scripting that these students highlight including the declared practices and representations that they have forged during their writer lives, both through their school experiences and in extracurricular self-directed writing activities. Students show different degrees in their metacognitive awareness of the writing traits and that their mostly positive attitudes to writing were not correlated to higher levels of writing skills but for the most part to the types of writing activities that they deem meaningful and that allow them to invest their cognitive and creative resources. For example, one student reported that writing helped her relax and to let her imagination run free. She shared that she was writing a fantasy story in French about goblins and creatures, which she enjoyed so much more than assigned topics that were based on real life experience (e.g., one’s hobbies or a film review), which to her was too formulaic and did not adequately reflect the level of creativity she was capable of. Other students talked about personal writing projects in their second language, English, including songs and emails to grandparents. One student explained that she had written a play in French at home and was translating it into English just for fun. Overall, students described positive attitudes towards writing in both languages, although they preferred to engage in creative writing activities when they were not required to place a heavy emphasis on spelling and grammar. Every student was able to identify a written text that they were proud of. We propose a broader reflection on the teaching and learning of writing in second languages programmes in bi/plurilingual contexts, with the inclusion of more creative and playful writing activities and greater freedom for students to choose their topics. By Carmen Rodriguez de France, Ph. D.
“We carry the embers of all the things that burned and raged in us. Pains and sorrows, to be sure, but also triumphs, joys, victories, and moments of clear-eyed vision. People give us those. People cause flames to rise in our hearts, minds, and spirits, and life would not be life without them” (Wagamese, Embers: One Ojibway’s Meditations; p.27). Late (and Great!) Ojibway writer Richard Wagamese left us earlier this year. His physical presence, gentle and reassuring, will be missed. His spirit however, has stayed with us. Through his poetic way of being in the world, through his words, and through his way of living life, I have come to understand Redemption, Reconciliation, and Resurgence as elements of life, and as important pieces in the process of putting back together what has been disrupted. I first ‘met’ Mr. Wagamese when I was flying back to Victoria from Saskatoon, after visiting Batoche, Wanuskewin, and Prince Albert. Being an immigrant from México and growing up in the 70’s, I had only learned about these places through photographs, magazines, and the occasional foreign film featuring Canada. To be in such places of beauty, history, and spiritual connection was overwhelming. The landscapes, the sky, and the power those places contain, still fill me with reverence, awe, and wonder. On the airplane, I found a discarded newspaper (which I kept). In it, a small image of the author caught my attention; and his words caught my heart. The heading read, “What it comes to mean” and from that day on, Richard Wagamese has been present in my life. Like many of his readers, I am one who is thankful for his presence in this world, for his gifts, which we received directly and indirectly, and for leaving us thinking about opportunities for Redemption, Reconciliation, and Resurgence. Redemption is sometimes defined as “the act of making something better or more acceptable” (http://www.merriamwebster.com/dictionary/redemption). In my work as an Indigenous scholar, I am in constant search for what my work “comes to mean” personally and professionally. I want to always remind myself of the need to make my work more acceptable, and better, especially since I was not born here in Canada; though my ways of being and feeling are close to many of the Indigenous people I have met, I am mindful that I am not “one of them.” Redemption then, becomes an everyday calling in which I reaffirm my commitment to my workplace, my colleagues, the community members with whom I work, and those I have yet to meet. Like love, Reconciliation takes different forms and shapes. Through his novels, poetry, stories, presentations, and in his editorials, Richard Wagamese showed us what Reconciliation can look like: A mother and a son making peace in Dream Wheels; a father and son reunited in Medicine Walk; finding a place to belong in Keeper N’Me; or reminding us that “people cause flames to rise in our hearts, minds, and spirits” in Embers. Through his words in prose and poetry, I have found a way to open doors to others who like me, are searching for ways to enact the Calls to Action from the Truth and Reconciliation Commission (TRC). One way in which I thought to take action was to start a Readers’ Club at a local branch of the library where, through reading the works of Indigenous authors, we have gained awareness and understanding of Indigenous perspectives, ways of knowing and being, and learn how to “climb the mountain” that Senator Sinclair speaks about in his speeches, addressing the shared responsibilities of Indigenous and non-Indigenous people to create a shared future. There is no one definition for Reconciliation. There is no one path to the mountain. Each of us will have to find a path or create a path; first, for reconciliation within, and then for reconciliation with the outer world. 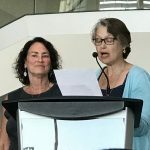 As we amble those paths, and in order to sustain the commitment to the Calls to Action from the TRC, we need acts of Resurgence in our everyday life. The outcome of such acts can yield different results depending on the context in which they are performed: educational, political, socio-cultural, and so forth. Ideally, the attempt will be to challenge the status quo, question history, connect our communities, and ultimately, restore disrupted nationhoods and livelihoods. Among other practices, everyday acts can include speaking one’s indigenous language, learning from Elders, following protocol, connecting to the land, deconstructing historical inaccuracies, and sharing knowledge on how to build a sustainable future.